Light Yaki straight clip on hair extensions resemble curly hair (including Afro hair textures) that has just been chemically straightened – straight out of the salon. Blending your clip in hair extensions is essential for a realistic look. If you have naturally curly hair that you’ve had chemically or heat straightened, you’ll be able to blend it with your clip in hair extensions. The more texture (curly) your natural growth hair is (before it's straightened), the more likely it is that it'll blend with light Yaki straight (relaxed straight) clip hair extensions. This means that if you have naturally straight or wavy hair, you may find that it’s shinier than light Yaki straight hair and so won’t blend as well; this is due to the overall shape of the hair strand itself. Those with straight or wavy hair textures should opt for silky straight or natural straight clip in hair extensions. Light Yaki straight clip hair extensions are available as single wefts as wide as 23cm (9 inches) for the back of the head and as narrow as approximately (1 inch) 2.5cm for the temples. As well as different sized clips, the larger clips are frequently available in different (weights) densities so you have the choice of buying a single 8” piece that weighs 90g or 8” piece that weighs about 30g (you can check out images of this here). 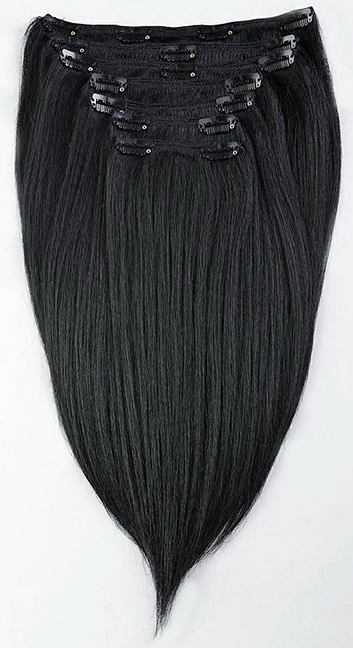 Light Yaki straight clip in hair extensions are also available in multi width sets. Sets usually have a minimum of seven pieces of varying widths and can have as many as 12 pieces. These sets are also available in a variety of densities (weights). If you’re a clip in hair extension Pro (or read any of our other articles on clip in hair extension textures), then you’ll know that light Yaki straight clip hair extensions are available in lengths 8-28 inches. Being a Pro, you’ll also know that there are longer lengths available but you’ll have to search CSI style to find them (btw that’s CSI Miami - you know it rules!). Light Yaki straight clip hair extensions are available in Remy, non-Remy and unprocessed hair (referred to by some as “virgin” hair). You can find colours in every shade from black through to blonde with light Yaki clip in hair extensions and if those don’t spark joy then you’ll be pleased to know that colours like pastels, tricolours, greens P-colours, purples, T-colours, red, two tones and blues, and many more besides are also available – Yeehaw! If you’re darker in complexion and prefer naturally occurring hair colours (we don’t judge) but aren’t sure what would complement your skin tone, you can check out the hair colour guide for those with darker skin tones. 1. Use a leave-in conditioner or deep condition your clip in hair extensions to repair and strengthen the hair. 2. Wash your clip hair extensions using a shampoo for chemically treated hair. 3. Chemically treated hair is prone to drying out, so use a light moisturizer that's free from mineral oils. 4. Smooth hair and seal in more moisture by applying hair oils to damp hair. 5. Detangle before and at the end of washing the hair extensions; always start at the bottom of the hair and work your way up. Light Yaki straight clip in hair extensions over and out! For more info about clip in hair extensions check the Hair Extensions Q&A section and to keep up to date with the next guide about clip hair extensions, hair weave, wigs and hairpieces, join our blog.